The world knows Kylian Mbappe by now. He has earned comparisons with Thierry Henry, won titles with Monaco and Paris Saint-Germain, and made the covers of magazines and newspapers across Europe. Now he has scored in the World Cup, achieving more before his 20th birthday than most do in a full career. His goal against Peru on Thursday was an important, if simple, tap-in. It gave Les Bleus a lead to defend as the South Americans poured forward in the second half. Mbappe was slowly phased out of the match, but not before making his mark. It was his inventiveness in the opening stanza that reminded everyone why France is considered such a bright attacking proposition. His tricky runs and audacious passages of play on the right flank give Les Bleus some much-needed personality. It seemed like he was ready to try just about anything on the big stage. Mbappe dinked the ball to teammates with the outside of his foot and dribbled with ease. He had so much fun in the first half, playing with a lightness that eludes some of the game's stars. Not even Lionel Messi has looked that relaxed at the World Cup. The shape of Didier Deschamps' team worked in Mbappe's favour as well. With Olivier Giroud leading a 4-2-3-1 formation, Mbappe was afforded a clear lane down the right flank. He was allowed the space to try whatever came to mind and the time to beat his man on the wing. N'Golo Kante also provided security on the right of the two-man midfield. He shuttled to the right to support Mbappe and allow his more talented teammate to attack. 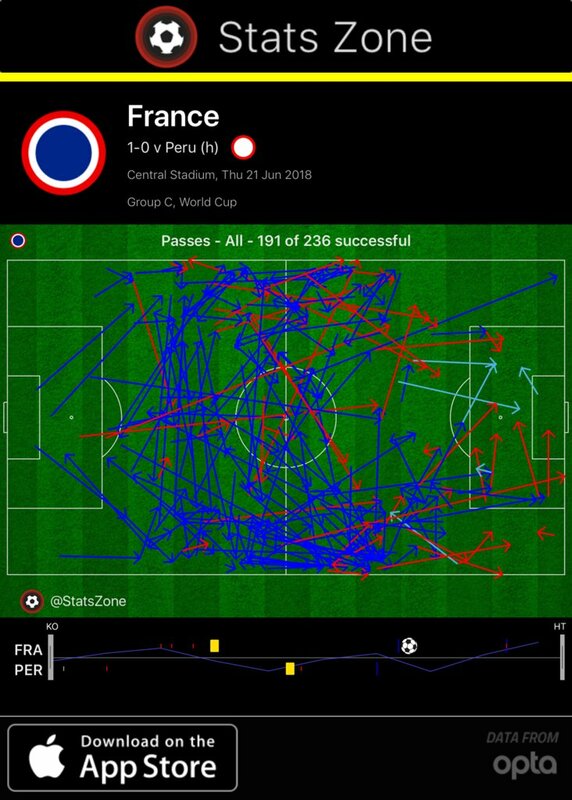 And when France went forward, it was almost exclusively down Mbappe's side. His teammates recognised how often he won the individual battles and overloaded Peru. Mbappe was the first to be sacrificed by manager Didier Deschamps in the 75th minute - and not necessarily because he was struggling. The match was no longer playing to his strengths. France had to defend against Peru's final hurrah, knowing the opponent would be eliminated with a defeat. But France needs more of Mbappe's verve and vision. He has to continue picking up this team. It's played too banal and too conservative in Russia. Mbappe has the characteristics - and more importantly, the confidence - to lead his country. And to think he has only just finished playing his second-ever World Cup match.